Graphisoft and Nikken Sekkei cooperation agreement bears first fruits for all ArchiCAD and Rhino users in new connector software between the two popular programs, bring leading edge modeling to a leading BIM application. Budapest, based Graphisoft, a leading Building Information Modeling (BIM) architectural software developer, has announced today a Rhino® connection for ArchiCAD. The connection enables ArchiCAD users on both the Mac and Windows platforms to import Rhino models into ArchiCAD as GDL objects. The Rhino-ArchiCAD link converts a Rhino model into ArchiCAD geometry. The container of the Rhino-based model is GDL, which is ArchiCAD’s generic object format. For larger and complex models, Graphisoft has introduced the option to convert a Rhino model into a set of smaller GDL objects. This process enables the user to retain separate logical parts within the same model while providing a functionality to monitor and easily update the imported Rhino models in ArchiCAD. The LCF option is also advised to enable ArchiCAD’s performance optimization algorithm to work seamlessly on an imported large Rhino model. 01 – Graphisoft’s cooperation with Nikken Sekkie turns into benefit for all ArchiCAD users with new Rhino add-on software. This technology has been developed as part of an ongoing collaboration between Graphisoft and Nikken Sekkei of Japan, that aims to develop future technologies for architectural design. 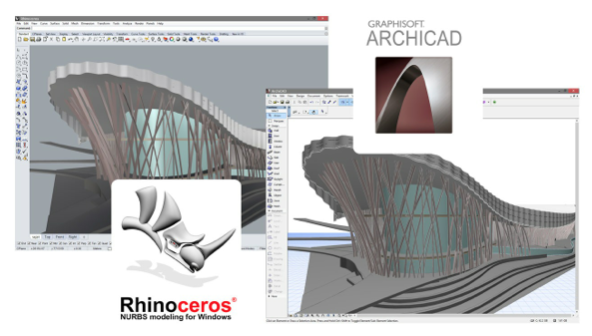 For more information on the new Rhino add-on for ArchiCAD, please visit the following link. The ArchiCAD add-on software for Rhino-to-ArchiCAD link is for ArchiCAD 18 has been in the works as a cooperative effort between Graphisoft and Nikken Sekkei. We wrote about this in early 2014 when we traveled to Japan for Graphisoft’s BIMcloud announcement. In our feature on Nikken Sekkei the discussion of Rhino’s importance came to light, so much so that the two companies had been working together to more streamline the process of bringing in Rhino models into the BIM tool the enterprise scaled architecture firm had standardized around. Originally, Nikken Sekkei with their own software developers wrote a converter application that took Rhino models to ArchiCAD 17. The company also wrote converters between Tekla and Building3D, its own proprietary structural analysis program. At the time, back in late March 2014, Graphisoft said that its agreement with the Japanese architecture giant meant that its cooperative custom programming efforts were non-exclusive. (see image below). One final note about this announcement is that Rhino has been very much talked about in our feature on BIG (Bjark Ingels Group) and in fact its their primary design tool. It’s interesting that Graphisoft’s sister company, Nemetschek Vectorworks, chose an alternative path in selecting to add in the missing visual-scripting component to its onboard Parasolid-based modeling technology. What we see with the Nemetschek Group companies is that they sometimes take different paths to similar ends. 02 – Nikken Sekkei uses a few dozen software tools that all need to tie into a smooth workflow. Interoperability is key and ArchiCAD is at the center of the process. Michael Johl liked this on Facebook.